WA’s beaches are the stuff of legends, and Rockingham is an awesome place to go for ocean adventures. With a marine park on its doorstep and a safe swimming beach, Rockingham has heaps of activities to pick from. You can kayak through the blue water and spot dolphins, step ashore on an island filled with penguins or check out the seaside shops, restaurants and parks in town. 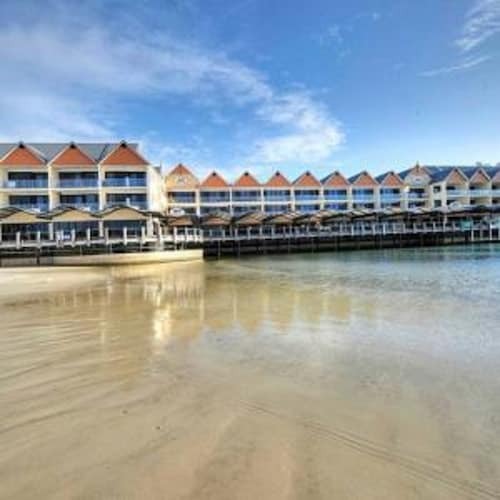 Book your Rockingham hotel with us and take the beach holiday you’ve been dreaming of. Rockingham is only 45 minutes south of Perth, so if you’re planning a trip to Western Australia, it’s easy to fit both destinations in. It was named after one of the ships that Thomas Peel used to transport a group of settlers to WA. The ship arrived during a storm and sank close to the shore and the settlers camped on the mainland, using ‘Rockingham Town’ to describe their location. On the shore of Cockburn Sound, Rockingham Beach has a jetty you can fish from and a protected swimming area that’s safe for all ages. The esplanade has walking and bicycle tracks. You can have a BBQ while looking over the beach at Churchill Park or find some coffee or fish and chips nearby. If you want a good view of the beach, you’ll get one with an adrenaline rush included with a tandem skydive from 14,000 feet. You’ll take in stunning views all the way across the ocean to Rottnest Island as you come down for a beach landing. You simply can’t miss Shoalwater Islands Marine Park, 500 metres off the coast of Rockingham Beach. A chain of islands covering an area of about 6658 hectares, it has heaps for animal lovers to see. Kayak or snorkel past limestone rocks and spot sea lions, swim with dolphins in their natural habitat and visit Penguin Island, a tiny island populated by the little penguins – the smallest species in the world. If you want more beach options, Shoalwater Bay has kitesurfing lessons while Port Kennedy Beach is an excellent place to head for a little peace and quiet, and you can find it by going down Port Kennedy Drive until you hit Bridport Point. There are several shopping centres in Rockingham, including the appropriately named Rockingham Shopping Centre, which is the biggest of the bunch with over 200 stores and an eight-screen cinema complex. If wine is your thing, the Baldivis Karnup Wine Trail awaits in the Rockingham Hinterland, with plenty of vineyards only a 20-minute drive from town. You can get to Rockingham from Perth via the Kwinana Freeway or, if you don’t want to drive, take the Mandurah train line from one of Perth’s train stations. Book your Rockingham accommodation and a flight to Perth with us and let Rockingham float your boat. How Much is a Hotel Room in Rockingham? Hotels in Rockingham start at AU$99 per night. Prices and availability subject to change. Additional terms may apply. Great location, great layout, enjoyable and relaxing. We didn’t use our car for 3 days because everything was so close! Would’ve been nice to have spare rubbish liners as 4 days are too long for one medium bin. We want to come back again! It was clean and modern. Free parking was very convenient. It was difficult to locate the hotel reception at first due to directions on Google Maps. Free WiFi was insufficient.